Foe (2018. 260 pages) is a science fiction thriller from Iain Reid. I’ll admit that I called it a thriller just as a place holder as this is not a book which gives up its answers easily. Depending on your perspective this could be a horror novel, an allegory about the breakdown of a marriage or an existential angst fest about how replaceable you might be in your own marriage. The one thing you can say for certain is that the book is very unsettling from the start. 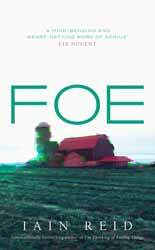 Reid does little world building and there is a reason for this, concentrating everything down into the relationship between the three characters on an isolated farm makes for greater tension and concentrates the readers mind on the inconsistencies in the relationships. We know that it is set sometime in the future. Riderless vehicles are the norm, for some reason you get into trouble for keeping chickens, the landscape has been taken over by genetically modified crops and OuterMore are building an enormous space station which they would like Junior to help with. So, straight off your mind goes WTF? A corporation, which has influence in the government, wants Junior, a dirt poor grain worker, to work on a space station... As what exactly? Terrance never explains, other than to say what a good opportunity it would be. Junior frustratingly never seems to question their ability to make him go and hardly questions why they should want him, and Eleanor just acts strange, blowing hot and cold in her relationship with Junior. It reminded me very much of Kafka’s The Trial (1925), where both the reader and Josef K could see what was occurring, but no context is given. This novel is very similar. Initially, it never explains just why Junior is so passive or so accepting of Terrance’s power to send him away for three years. It’s bad enough when he just visits, but half way through the book Terrance moves in. His excuse is that they will provide his wife with a simulacrum of Junior so that she does not feel abandoned, but Terrence’s actual behaviour makes Junior virtually cuckold. It’s an amazing piece of writing which keeps you constantly wondering about just what is going on and why do the relations between the three main characters feel wrong. It’s a story which simultaneously shows you everything but tells you nothing. Things are resolved in the end with a nice couple of twists to the tale. I did get the main twist about a third way through the book, but the concept is so intriguing that the book remains compelling reading right up to the end, where there are twists you will not be expecting.